THE PACIFIC BLUE INN | Stay luxurious, stay green! STAY LUXURIOUS, STAY GREEN. SANTA CRUZ AT ITS BEST! The Pacific Blue Inn is Santa Cruz! 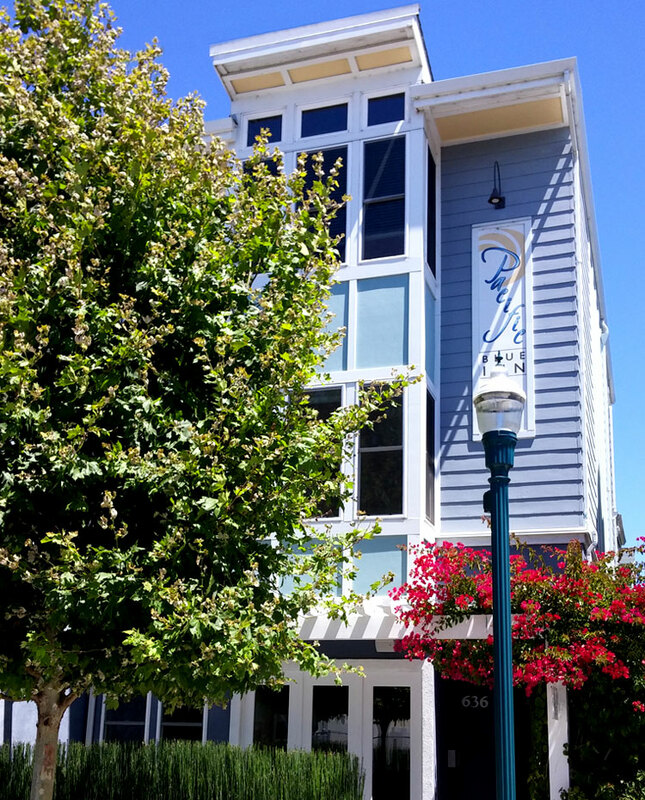 Promoting green living and a healthy outlook on life, the Inn is located on Pacific Avenue within walking distance to the best Santa Cruz has to offer. Inspired by the NY Times article “36 Hours Santa Cruz” the founders of the Inn set out to create an environment that would allow visitors to take advantage of the best of Santa Cruz all within walking distance of their accommodations. Nestled halfway between Santa Cruz’s world famous Beach Boardwalk and the bustling Downtown area, Pacific Blue Inn offers you a quiet secluded courtyard hotel room to get the perfect nights sleep, right within walking distance to restaurants, cinemas, performance theatre, music venues, bookshops, galleries, the beach, surfing as well the world famous Beach Boardwalk amusement park and wharf. You can even walk to the historic Roaring Camp Railroad which stops at Depot Park and take a ride through the virgin redwood forests of Henry Cowell’s State Park. So, leave your car in our free parking lot and get the most out of your visit. Pacific Blue Inn is a SMOKE FREE environment. Get swept away with great activities and outdoor fun in the Santa Cruz area. Enjoy the beauty of the Pacific Ocean from the Monterey Bay Wildlife National Marine Sanctuary, a beautiful spot to enjoy kayaking, sailing and whale watching while experiencing the diverse wildlife of the bay. The waves of the Pacific Ocean call surfers from around the world to our local famous breaks like Steamer’s Lane, the Hook at Pleasure Point, and world renowned Mavericks. The beautiful Santa Cruz beaches are just the beginning. The downtown area boasts comprehensive shopping selections, sidewalk cafés, over fifty restaurant choices, and an exciting nightlife with several music venues, cinema and live performances, plus a wide range of professional services. It’s All Right Here! Why Are We So Green? The Pacific Blue Inn exceeds California’s stringent green standards. It was built with non-toxic long lasting blue wood and utilizes recycled, reused, and reclaimed construction materials and hotel dècor. Water is precious so we’ve installed the latest lower water use fixtures and equipment throughout the building which, even though they save water, don’t give up the luxury that higher water pressure valves provide. Non-toxic paints and cleaning products mean we eliminate any harsh chemical pollutants. We utilized renewable bamboo flooring and energy efficient lighting and appliances to reserve our natural resources. Reducing carbon footprints is easily achieved with our central downtown location. Three of our nine rooms are totally ADA compliant. Two of them have fold down shower seats. All nine of our rooms have “wheel-in” showers and are “wheelchair friendly”. If you’re disabled and need something “special” just give us a call and we will do our best to accommodate you. Discover all that Santa Cruz Country has to offer. Find out about the latest news for visitors, or check out what's happening this week. News, arts and entertainments, music, dining, movies, columns in Santa Cruz from Good Times. Voted World's Best Seaside Amusement Park!